My band loom has been sitting idle for a few weeks. Instead of continuing to walk wistfully by, I decided to do something about it. On a whim, I pulled colors of cottolin thread off the shelf. Within an hour the band loom was dressed and I was happily weaving. Finally! Why did I wait so long to put a warp on this loom? Do you ever avoid something, and then later realize the task is easier than you thought it would be? Two-treadle Glimakra band loom with cottolin (cotton/linen) warp. Green thread on the hand-carved shuttle makes little green weft dots on the brown selvedge threads. 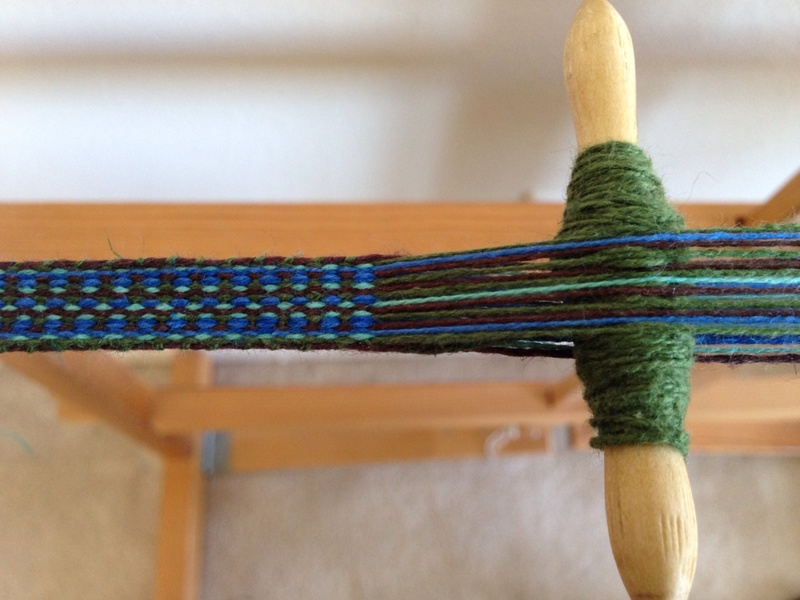 I used my warping reel to wind the five-yard warp. After tying the lease cross, and adding a few choke ties to secure the warp, I took it to the band loom and wound it on. Easy! Sitting at the band loom, sending the little shuttle back and forth, beating with the band knife to the rhythm of the treadles… it’s music; and it’s serene. Voicing our needs to our maker is something we think we do not have time for. We avoid this one simple connection that makes a difference. Heartfelt prayer is our vital connection with God. He hears our prayer of need. Let us not fool ourselves to think it takes too much time or effort for this connection. The reward is too great to miss. May your needs be heard. A Different Kind of Band Music; How to Fix a Listening Problem; More than Meets the Eye. I love threading the heddles! It allows me to touch every single thread with my fingers. I guide each thread through a heddle on one of four shafts. Threaded heddles set the stage for the motion of cloth-making. Each thread has its own path, yet groups of threads function together as a unit. Kind of like a friendship network. 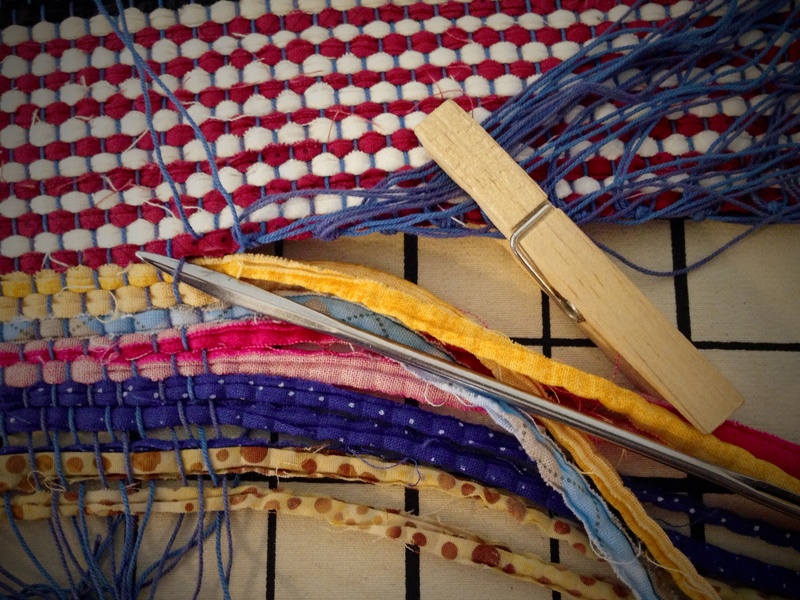 With 36 threads in each grouping, the Texsolv heddles are threaded one-by-one, using only hands and fingers as tools. I double-check my threading as I go. As I finish each section, I immediately go back through the bundle thread-by-thread to verify that each thread is inserted accurately. This effort on the front end is worth it. 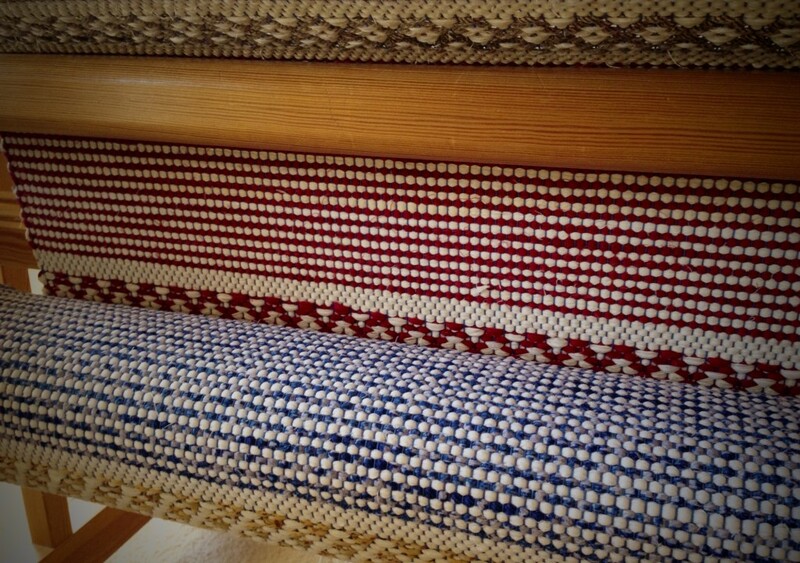 With every warp thread in its proper place, the design in the fabric is assured, even before the weaving begins. A friendship network is like that. Each person has their own path, and when those paths are aligned and given common purpose, the individuals form connections that make a friendship fabric. 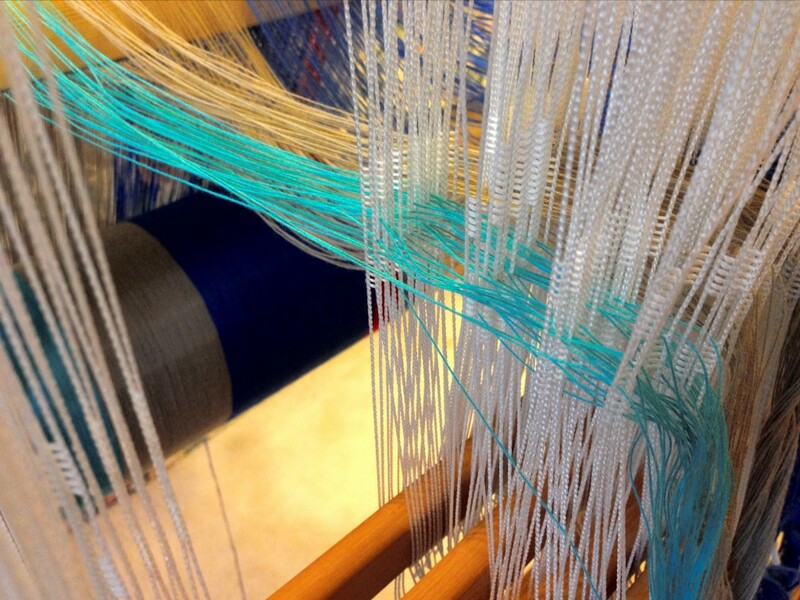 Connection with our grand weaver gives us a friendship network with each other–a skillfully woven fabric. The beauty of this created fabric is that it reflects the heart of the maker. Each individual thread, aligned with the others in interesting patterns, becomes an essential part of the finished cloth. May you glow in the fabric of friendship. Your rag rugs are superb; I am quite jealous! Do you have a reliable sett for twill threading, Karen? I have read so many books, but can’t seem to find something that will catch both selvedges. (Using 2 shuttles works, but not always necessary.) Also, the sett you use for firmness? Hi Fran, I’m glad you like the rag rugs. I sure do enjoy making them! I don’t mind sharing at all; I love sharing what little I know! For rag rugs, my sett is 8 epi for plain weave and for twill. For the 16/2 cotton towel project in this post, I’m using a 22.5 dpi reed and my sett is 45 epi. The sett doesn’t affect whether the selvedge threads are caught or not. Sometimes, with a twill threading, a selvedge thread isn’t caught. Usually, I don’t worry about it. I consider it a design element, if it even shows at all. The sett for firmness would depend on: what threads are you using, what is the weave structure, and what is the intended use of the finished fabric. Usually, a closer sett will give you a firmer fabric. I hope you get to go to Joanne’s studio. I’ve been there twice. Both times in the snow! The whole experience was delightful, and I learned a lot. Joanne is an excellent and patient teacher. Hope that helps! Ask questions any time. 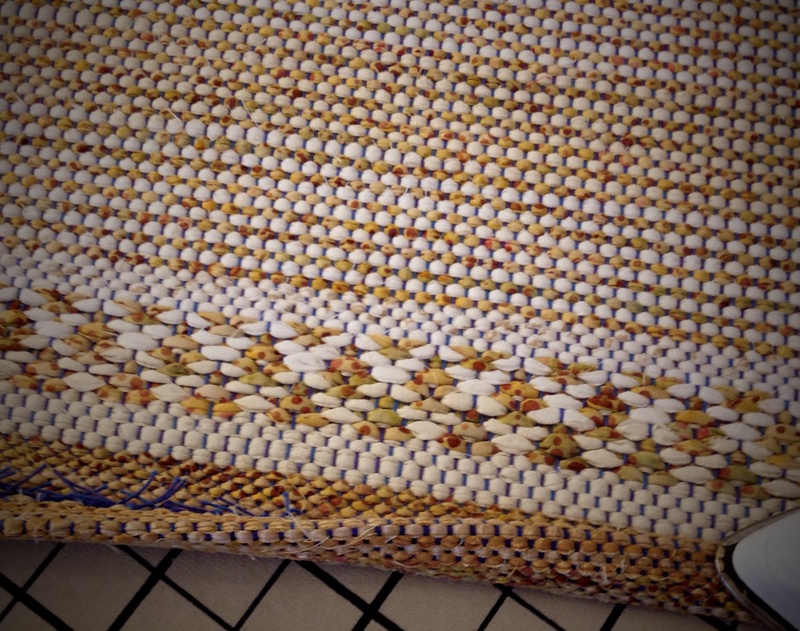 After the weaving is complete, the only thing left is finishing. For rags rugs, that means securing the warp ends, and finishing the ends with fringe or stitched hems. I prefer the look of hems over fringe, so my rugs usually have turned-under hems (occasionally, I do a bound hem, but I’ll save that for another time). The hem area is woven with narrower strips (about 1/4 in. or 1/2 cm) than the rest of the rag rug, to make it less bulky for turning under, and it lays nice and flat on the floor. Ah, rosepath rag rugs, I shall truly miss seeing you on the loom! The end is the beginning. The end of the warp means the rugs are ready to be unrolled from the cloth beam. Step 1. 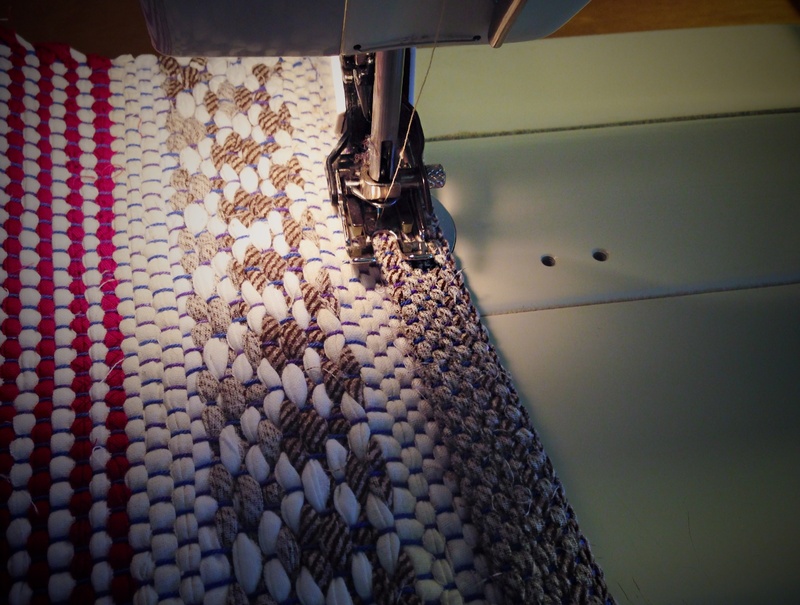 An upholstery needle helps separate warp ends from the header. A clothespin keeps finished ends out of the way. Step 2. Secure the hem with square knots. Four ends at a time, pulled out of the header, are firmly tied into knots. Step 3. Trim the warp ends about 3/4 in / 2 cm from the knots. Step 4. Fold hem edge to the back side of the rug, keeping the knotted ends inside the fold. Press. Fold again to complete the turned hem. Press. Step 5. Stitch close to the fold of the hem. Stitch the side edges of the hem closed. Be sure to use sewing thread in the needle that matches the underside of the rug, and bobbin thread that matches the top of the rug. 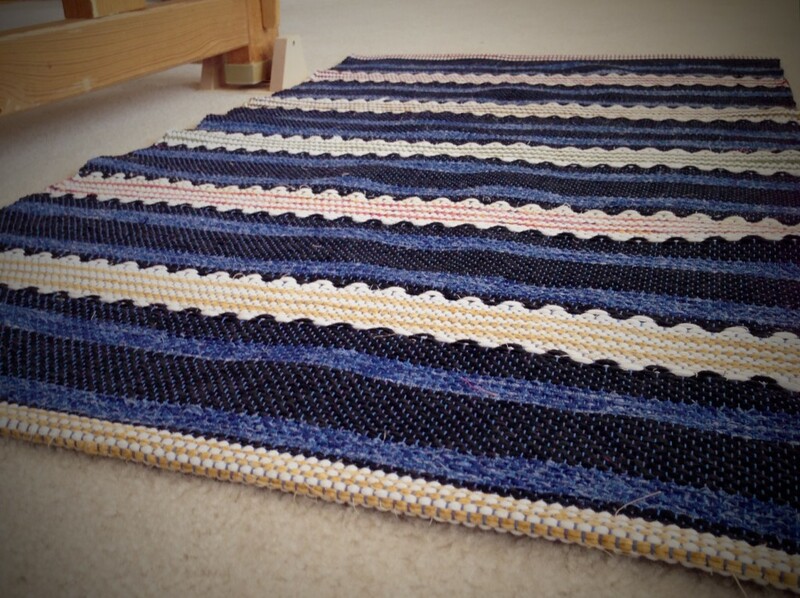 Rosepath rag rug, hemmed and ready, with the look of a breath of fresh air. Let’s call this one the “Welcome Home” rug. We’d love to have you stay a while. May weary feet find your home to be a welcoming place. 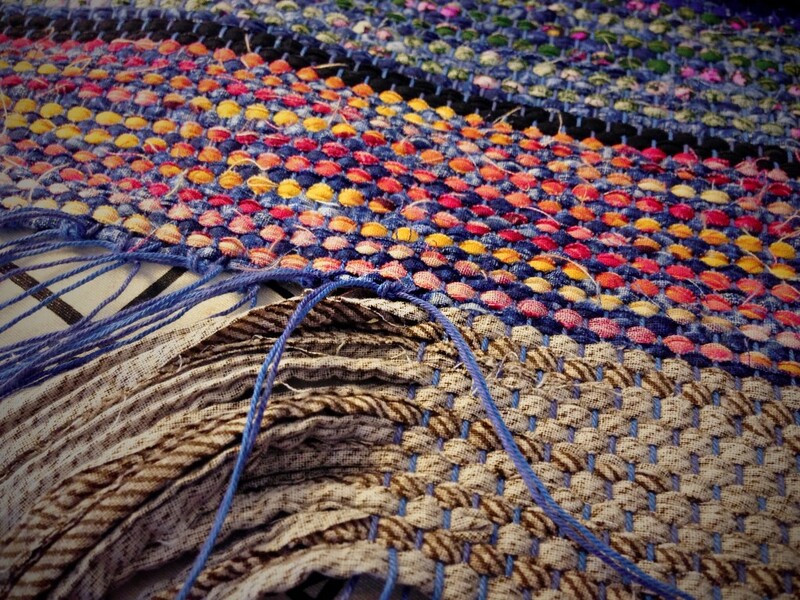 Ok – now I really want to try my hand at rag rug weaving. Alas, I don’t think that my 4-H Leclerc Artisat could handle it, as the upholstery sample I wove on her last summer seemed to be a stretch. Those rugs are so beautiful. I’m so pleased for you. Thank you, Laurie! Your kind words mean a lot. I have been told that some looms are not well-suited for the very tight tension needed for good rugs. But I don’t have experience with jack looms. The only looms I have experience with are Glimakra countermarch looms. Maybe there’s another loom in your future?? Looms do seem to have a way of multiplying. They look fabulous! Who knew coloring in all those little blocks would come to this! Ha ha, Cyndi, yes, those drafting lessons with Becky Ashenden do pay off! Thank you for the yarn information! Very helpful. Your rugs are amazing. So beautiful. 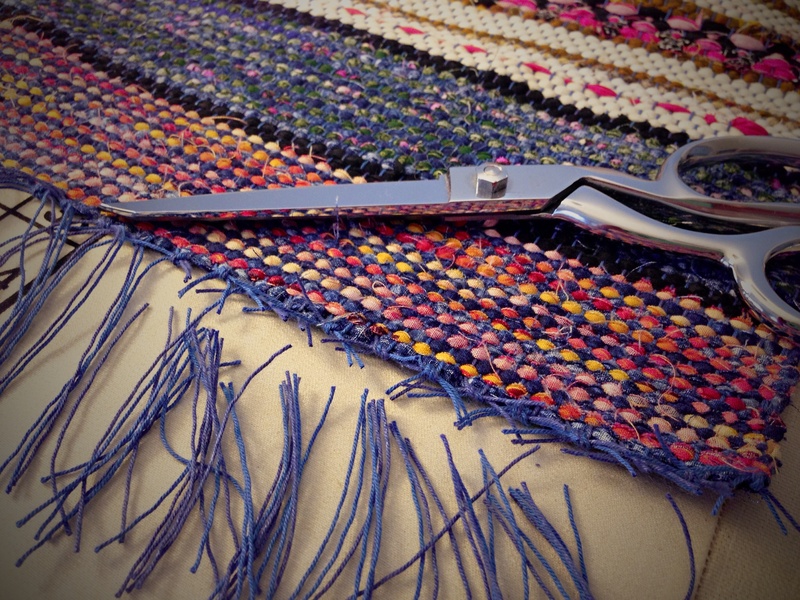 really helped with rag rugs when I owned a Leclerc jack loom. I love my Glimakra for its strength and weight! Thank you for the great advice. I noticed that Leclerc sells weighted beater bars for almost all of their looms, but not for the Artisat. I will put your advice to work someday soon. I had thought about adding four harnesses (and back-hinged treddles) to my beloved loom, but have decided that instead I will most likely get an 8 shaft countermarche – somewhere down the road. (way down the road, but that’s ok!) Karen – you’re right, those looms do have a way of multiplying! You are very welcome, Judith! Glad the information was helpful. I’m thrilled you like the rugs. It’s always a relief to hear positive comments about finished work. It’s hard for me to be objective about my own work. Thanks for pitching in to help Laura! We’re becoming our own little community… Yay! How do you thread the salvages so you don’t end up with floats along the sides? Hi Suzy, That’s a really great question! Thanks for asking. 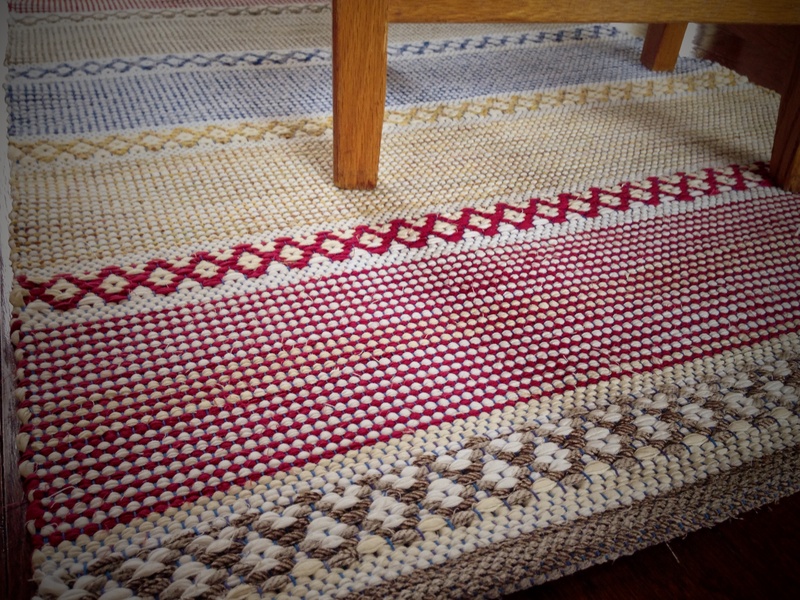 For rosepath rugs, I do not thread the selvedges any differently than the rest, except that I often double warp ends in the last two outer heddles and dents for durability. It is tricky, though; like you said, you can get pesky floats at the edges. For me, it’s a little bit of trial and error in sampling that helps me end up with tidy selvedges. 1. With rosepath you have two different weft shuttles. This gives you an advantage at the selvedges because there is usually a way to catch the selvedge with the second shuttle if it’s not caught with the first. Usually, it helps if you start both shuttles from the same side. 2. Remember that when using two shuttles, if the previous weft went under the outer warp, take the second weft under the first one before entering the shed. If the previous weft went over the outer warp, take the second weft over the first one before entering the shed. If under, go under. If over, go over. This will usually lock in the weft and eliminate a float. 4. Experiment. Sometimes you think you have #3, but if you simply start the wefts from the other side it will work out. Thanks for the tips, are you weaving with floating selvedges? I have tried to thread for a plain weave selvedge, but still experimenting. Your rugs are so beautiful. I never use floating selvedges. Keep experimenting. That’s fun to do, and you learn so much in the process! Thanks for the compliment. I’m glad you like the rugs. I love your rugs. Do you sell them? I need 4 rugs made. I would love to work with you. I’m so pleased you like the rugs! 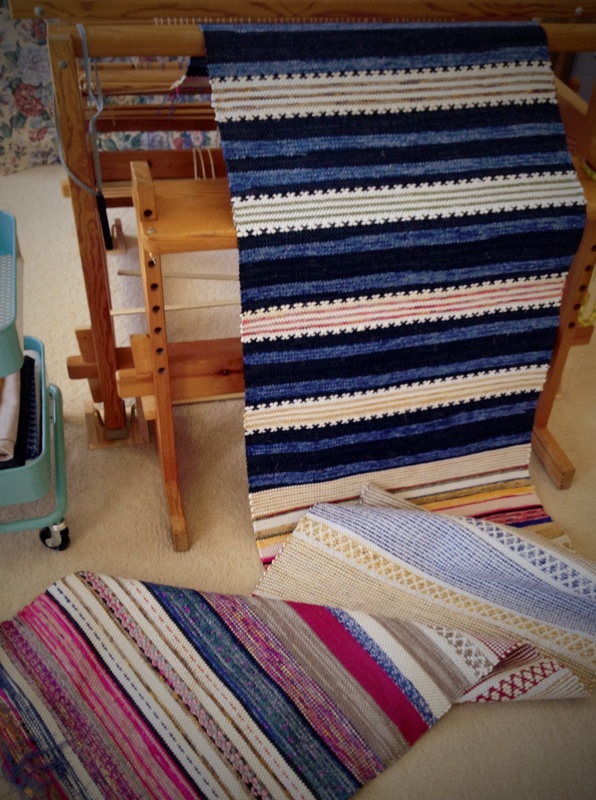 I’ll put it this way – Yes, I would like to sell the rugs I make. I just haven’t yet. Generally, I don’t do commissions, but I would still love to talk. Please send me an email – karen at warpedforgood dot com. Beautiful work my friend. Just dabbling in it myself. Doing place mats, just to get my feet wet. Wondering about the hem. Now I get it. Thank you so much for the compliment, Tom! Place mats are a perfect choice for getting your toes in the water. These hems are easy to stitch by hand, too. Just stitch up the side of the hem, and then catch the warp threads going across with your needle; and lastly, stitch down the other side of the hem. You see the bare warp. How will the finished towels look? We won’t know until the weft is chosen. I will hold an audition for colors and fibers in my stash, and find the most worthy candidates. Questioning and testing in this way, by sampling, helps me discover the best possible options, before committing to the whole 7 1/2 yards (6.8 meters). Cotton warp as it is being beamed. The threads come over the back beam, and down to the warp beam, as viewed from the back of the Glimakra Ideal loom. We are created to find our maker, to discover who he is and what he is about. Surely, this accounts for our endless quest for answers about everything. In searching for the answers to the deepest questions, we feel our way toward our creator. And we find him waiting for us with open arms. He’s been near all along. May your questions lead you to joyful discoveries. Curious to know how the black & white photo turned out. U.S. frequently. Thank you for any suggestions. I use Bockens cotton from Sweden. It is high quality, has many colors to choose from, and it seems to be pretty much colorfast through washings. I order almost all of my thread through Joanne Hall at Glimakrausa.com, but there are other suppliers, too, that carry Bockens cotton. Borgs, another Swedish company, also makes high quality thread in some of the finer sizes, like 24/2 and 30/2. 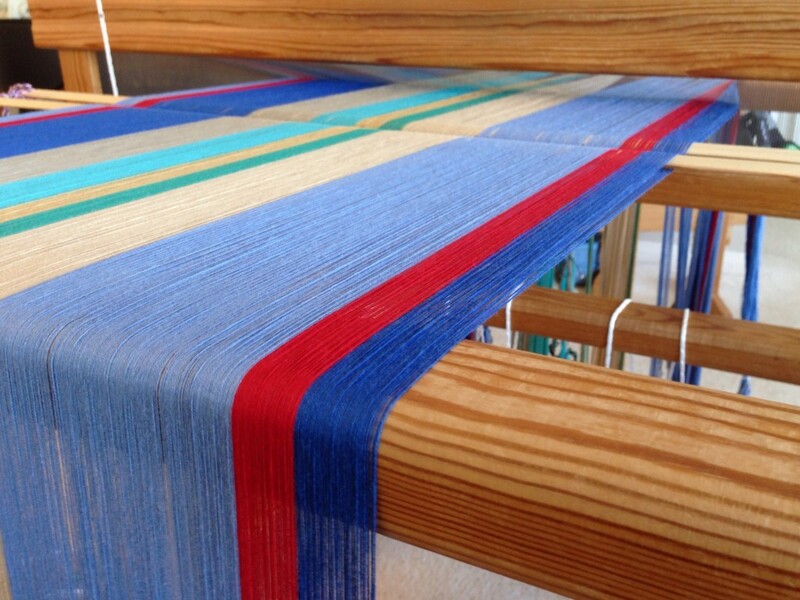 How do you go about choosing a threading and treadling design with the different warp stripes? Do they coincide with a particular design, or is it a basic twill? This particular design does coincide with the stripes, but I have done stripes that do not coincide with the design. It depends on the look you want. Sometimes, not aligning the stripes with the design can bring depth and interest, but you also take a risk that it will look unbalanced and incoherent as a whole. It is fun to experiment and find out what works and what doesn’t work as well. This particular project is a little different from a “basic twill.” This is a three-shaft twill. I’m adapting a draft from Väv Scandinavian Weaving Magazine, 1/13, p. 59, “Viking era handtowel.” There are 36 ends to one repeat of the pattern, but that’s actually 18 ends, twice. So I coincided my stripes with the 18-end pattern by thinking of 18 ends as one unit. (I hope that makes sense.) You could use the same concept with a basic twill, or with any repeated pattern of threading. Figure out how many of those units you have, and then determine where you want the color changes to be, according to that. Write out the exact warp order sequence, with number of threads, so you can keep track as you wind the warp. Happy weaving, and bravo for wanting to jump in with your own designs! Karen – this was so very helpful. I love waking up to your blog – I am so inspired. Thanks so much. Claudia, You are so kind! What would you do with nine colors of 16/2 cotton thread? Play with color, I hope! I have hand towels in mind, in a subtle three-shaft twill weave. I challenged myself to create a pleasing arrangement of stripes for the warp. Hmm, should I use a Fibonacci number sequence…or evenly-spaced stripes? Random color order…or planned color order? I came up with several possible color arrangements; each one is unique. You and I are colorful and unique, too. Assorted colors of 16/2 cotton from my stash. 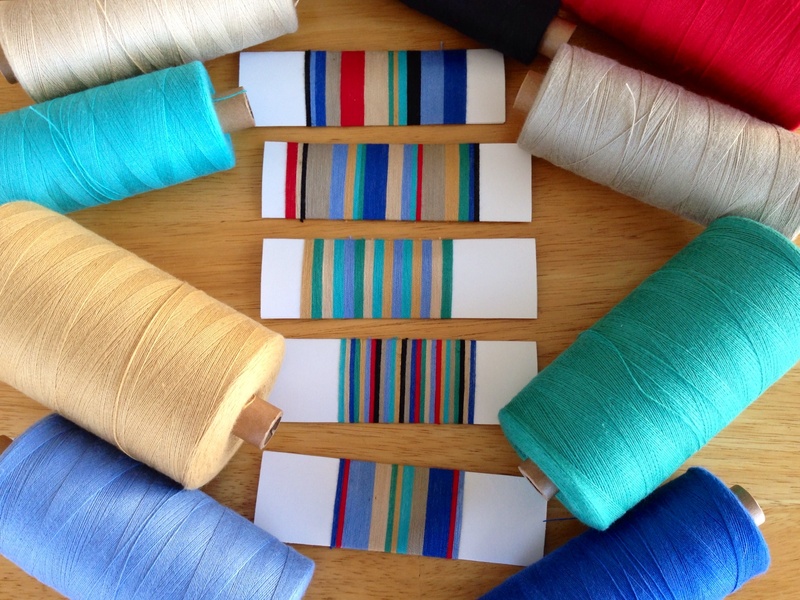 Wrapping the threads on folded index cards is an easy way to try out different stripe patterns. Two of the patterns have evenly-spaced stripes. The other three use a Fibonacci number sequence to set the width of the stripes. The grand weaver has designed you with certain colors as a gift to you–for you to enjoy life. The way to take full advantage of that gift is by using your colors to serve others. First, receive the gift with open hands. And then, whenever possible, give your gift away. Which of the five arrangements of stripes in the picture appeals to you the most? I’d love to hear your opinion in the comments! I am curious to see if the one I decided on receives any votes. May you unwrap your gift. Number 2 and 5 looks best to me – can’t decide which of the two! Well, Birthe, I had a hard time deciding which one to go with. I changed my mind three times. haha! They are all beautiful – just like your descriptive comments about the colors of life. So very glad our paths have crossed. Cyndi, I’m very glad our paths have crossed, too!! These color cards makes me think of groups of people. All five of these combinations have a place and a time, both among people and in the things we surround us with. Number 1 as a group that lacks balance and where most members have strong opinions. Number 2 as a group with a strong leader and colorful members. Number 3 as a balanced group working behind the scenes where all members play an equal role. Number 5 is interesting…a group with a couple of strong but not so visible members (red) are keeping this group from falling apart despite its lack of focus and diverse members. A hand towel is such a small part of our life; at the same time it serves an important function. It affects us every time we touch it, either it is drying off our hands or folding it after it has been washed. It affects us every time we glance at it in between uses. It affects us every time we open up the drawer or the cabinet door where it is stored. My favorite is number 3. I would enjoy the balanced subtlety because a hand towel has such a quiet purpose despite its frequent use. Other people see the world differently and would need different things in their life. Subtlety happens to bring joy to my life, you best know what brings joy to your life. There is not right or wrong here, just different. I’ll vote for number 5, Have you tried to take a black and white foto, then you can see the balance between dark and light. I like how the black contrast makes the other colors “pop.” But I think my favorite is the last one – kind of between the most subtle and the most bold. I’m trying to find the right balance in this transition period between my past occupation and where God is leading me next. I’ve applied for an open position with a local crisis pregnancy center. Pretty excited about the possibilities and the eternal impact it has. It is very interesting to hear everyone’s point of view. I love the thoughts you are writing in the comments. I agree with Elizabeth, that there is no right or wrong here, just preference. There is right and wrong, and there are preferences – and it’s good to know the difference. Grethe, great advice! I didn’t even think of taking a black and white photo to see the balance. I’m going to try that right now. Finding the right mix of colors in a season of life is a challenge and an exciting adventure. Way to go, Barbara! I like the fifth combination of colors. It’s balanced, but has differences, like people in general. Claudia, I like your observation! year at our Guild sale all the dark coloured tea towels sold first! They are popular now. I really like more natural colours. I am sure whatever you pick will be beautiful as they all look nice. Actually 16/2 cotton also makes a nice light weight scarf! Did some beautiful ones at a workshop last summer. Judith, I’m glad to get your vote! I enjoyed reading your thoughts behind it. I made scarves out of 8/2 cotton once, and they were too chunky. I think 16/2 cotton would be much better. I’ll have to put that on my list of things to try. I like 3 and 5 best. Both are beautiful! 3 and 5 turned out to be most popular. They are my favorites, too. Thanks for weighing in!